From WB No. 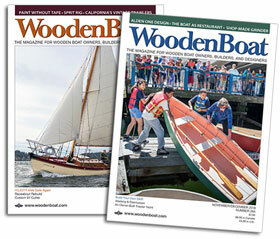 256, May/June 2017: Featured in Design Sketchbook from WoodenBoat Magazine. BLACKTIP is a step up from cabinless camp-cruisers. With two small two-berths, sitting headroom, and a cookstove, the boat offers more comfort and convenience. The cat rig is lightweight and easy to handle. The bimini top offers ample protection from the harsh Australian sun. It must be easily and quickly stowable, in case a big wind comes up or the crew needs to stand up in the cockpit. The relatively wide beam offers good form stability, and the full sections forward will keep the bow from depressing under sailing loads. The spars are of carbon fiber—though they may also be built of wood. The swing-back bowsprit handles either a gennaker or an asymmetrical spinnaker. 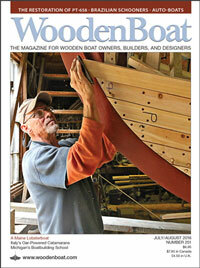 For more details see WoodenBoat 256, May/June 2017.